Retracing my steps to Belem: French Guiana and Macapa in Brazil (9th October to 11th October) | I should have turned left! I left Paramaribo at 5am in order to catch an early ferry to French Guiana (there are 4 ferries a day so no major panic but I was hoping to get a morning one) The border crossing out of Suriname to French Guiana was so easy, I mean crazy easy this is the kind of border crossing the need all over the world. They do the usual passport checks / stamps but don’t give a damn about a motorbike as it is for personal use so no customs, super cool. 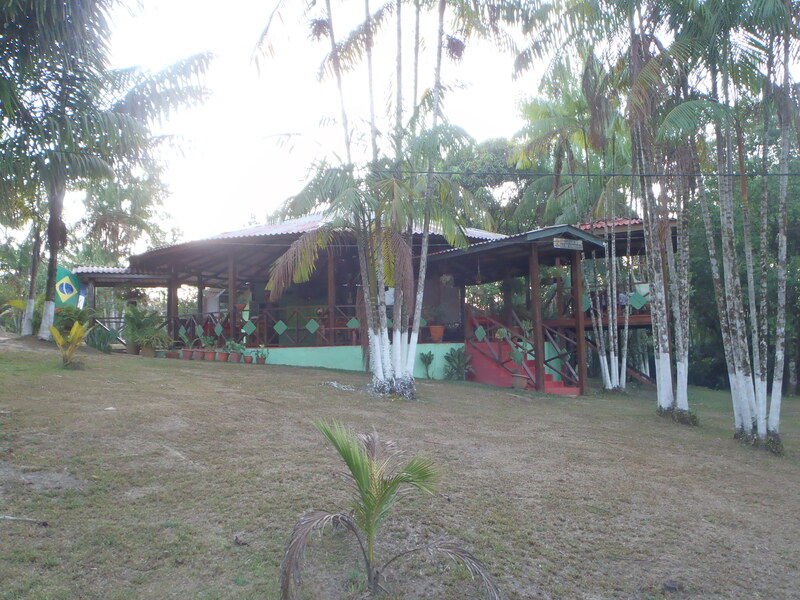 I continued directly onto Cayenne as it was only about 200kms away and it was only 11am when I landed in St Laurent so no need to spend the night. Cayenne was uneventful I had a good mean and spent the afternoon in the pool at the hotel. 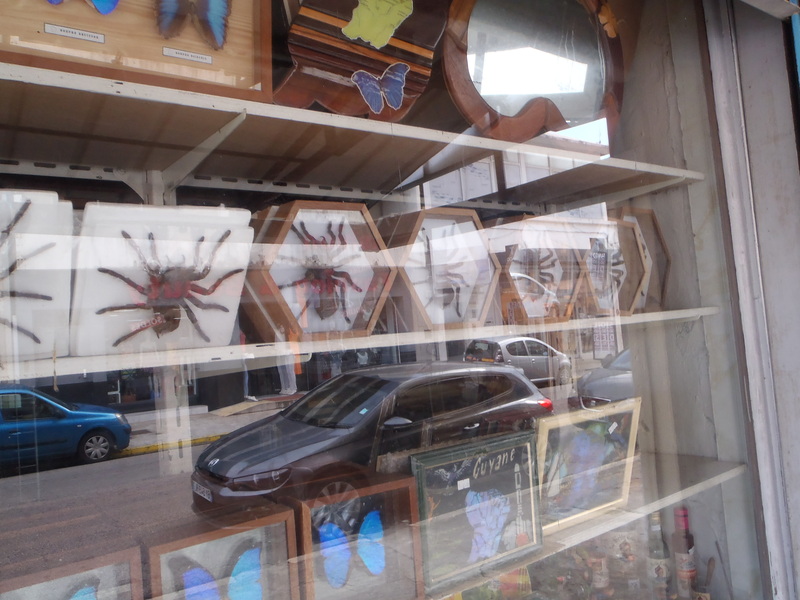 there are tons of framed dead spiders in Cayenne and I was very tempted to buy one but knew it could get broken on the trip or even if I posted it. the shop was sadly closed so this the only picture I could get. At St George I did the passport thing at the police station, quick and easy and then went to find a ferry. 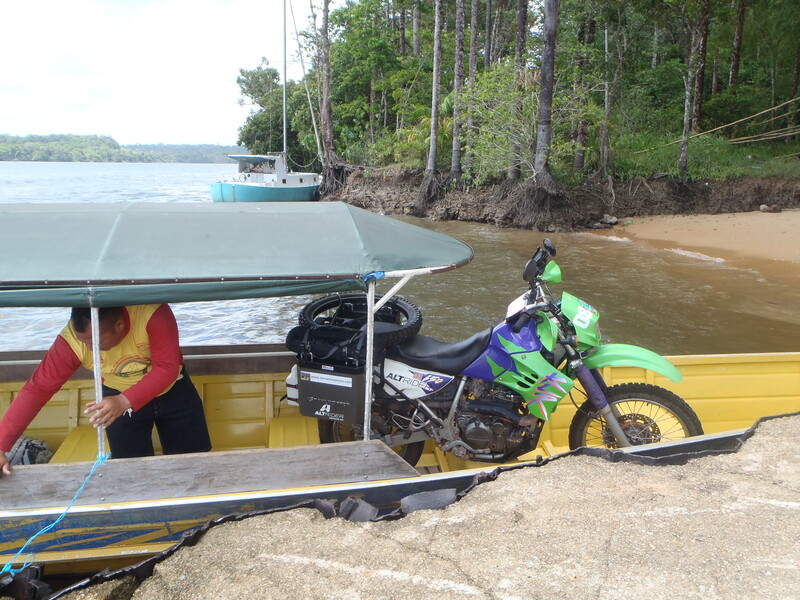 The actual official ferry was not there and I was told by the cops that it is very expensive but not a problem to put my bike on a small boat i.e. it is quite legal. 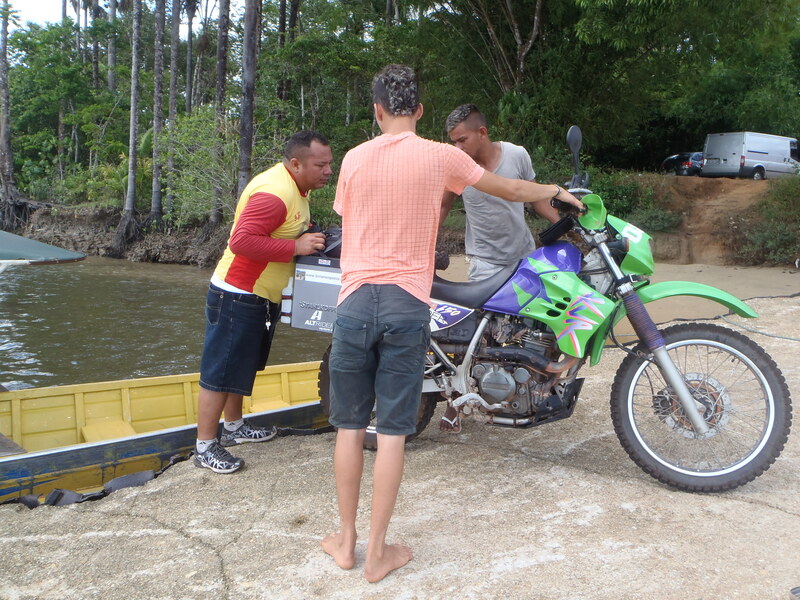 At the doc a few boatmen approached me and told me it would cost Eur50 to take my bike across to Brazil. I tried to argue the price down but they were not having it. 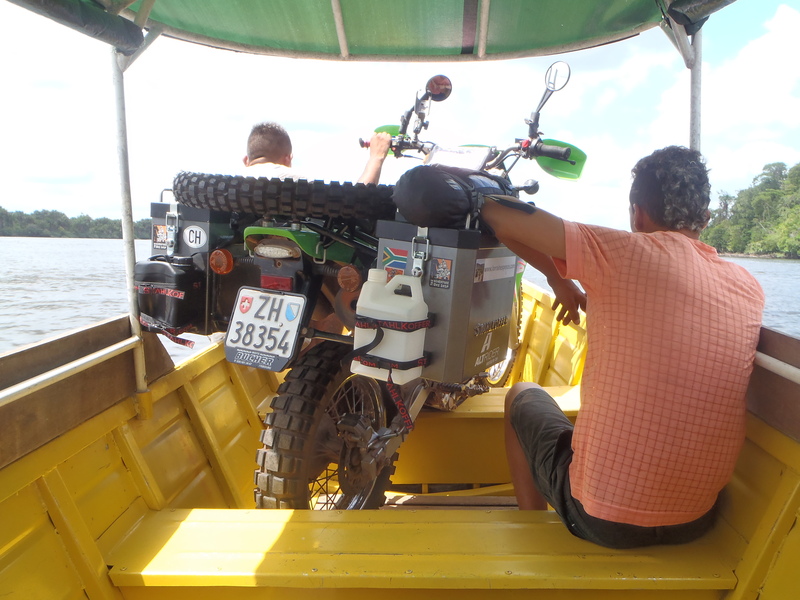 So I agreed and we started loading the bike OMG, it was far far easier to get an empty 250 onto a canoe in Myanmar than get my 650 onto this boat. 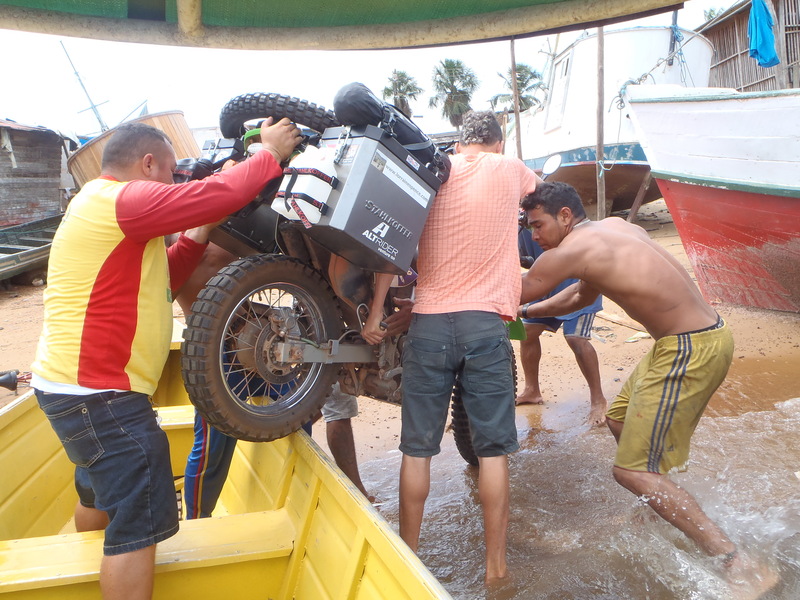 Eventually I just stood back and let the experts handle gadget onto the boat… I think they have done this before. I did feel bad though as one of the lads cut his leg open on the bike, it was not very bad or deep and stopped bleeding quickly but I still felt bad for the chap. Again I completed the very easy passport control at the police station and then headed to a couple of hotels whose addresses I’d noted down only to find they were full. I tried 6 places in total but it was Friday and some big cycling event was taking place that weekend (well that is what I think people were explaining) eventually I went back to the first place and explained the situation to the very nice owner who agreed that I could camp on his lawn. He even refused to charge me anything and then apologised for the bathroom that I needed to use which was in the laundry, but it was great very nice and clean. Wow talk about fantastic hospitality. 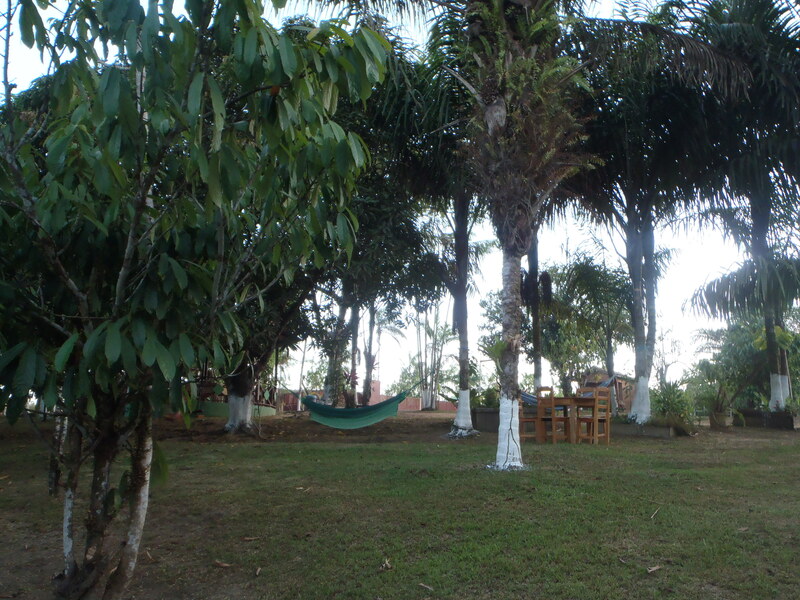 I spent the afternoon just relaxing in a hammock reading my book totally chilled. I considered riding the 288kms to Calcoene but since it is a dirt road and it was already 1:30pm I decided to play it safe and stay and head to Calcoene in the morning. 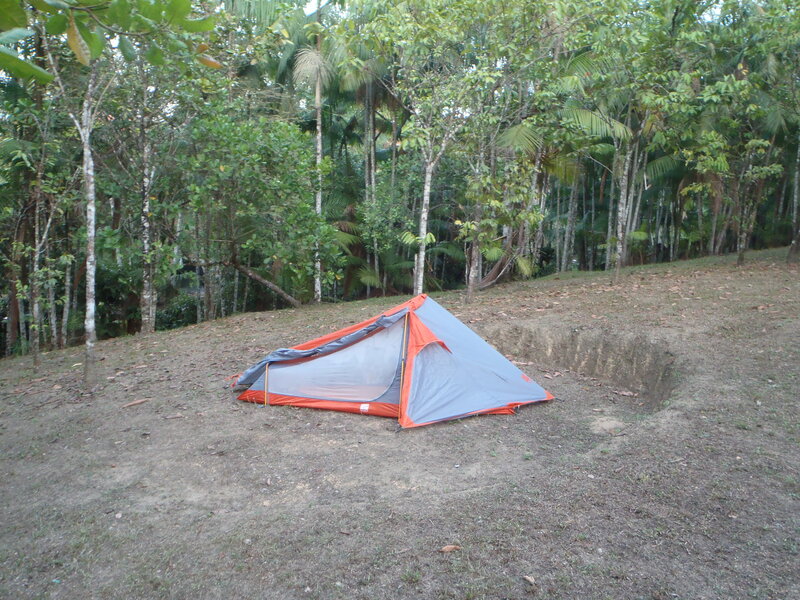 I had a lovely night camping at Chácara do Paraíso and can highly recommend this place, a real oasis with lovely chalets, fantastic restaurant and a swimming pool.